Sakhu Sheti are two terms from the Medu Netcher (Egyptian Hieroglyphs). The word “Sahku” means ‘understanding, the illuminator, the eye and the soul of the being, that which inspires.’ “Sheti” means to go deeply into a subject…'” (pg. 395, footnote 36). 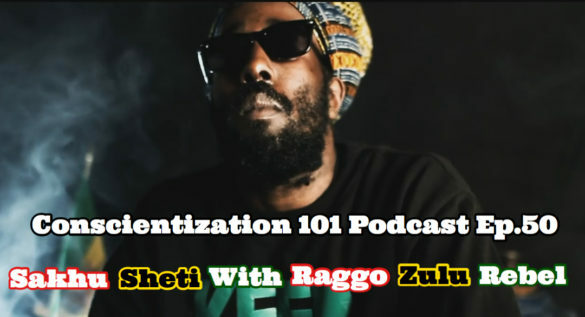 In our 50th podcast episode with U.K. based recording artist Raggo Zulu Rebel…“we came to a deeper understanding” about who we are as African people. So sit back and enjoy as we delve into such topics as: nationalism and cultural unity of Africa, cultural misorientation, the cultural basis of economics, and much more. Raggo Zulu Rebel from his albums Selassie I Son (2007), The Return of Jah Messenger, and Jah Messenger: the tracks are “Dreadlocks Man ft. Spliff Range & Jah Mirikle”, “Deeper”, “Old School ft. Sicko”, “Skylarkin”, and “RasTafari ft. Jah Mirikle, Rass Gregg & Spliffy” respectively. Books mentioned in this episode were Chancellor Williams’s Destruction of Black Civilization: Great Issues of a Race from 4500 B.C. to 2000 A.D. and works by Ward Churchill.